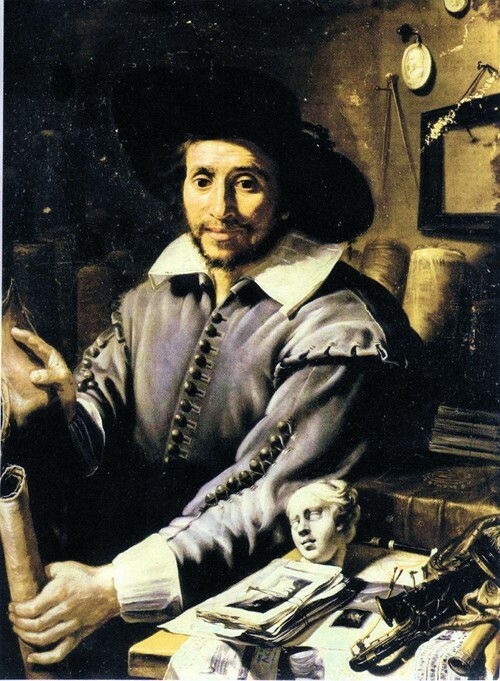 Another recommendation to Dr. Alfred Bader was a very striking portrait of the seventeenth century French art dealer François Langlois(1588-1647). This portrait was offered by Christie’s New York on January 26, 2005 as lot number 4 and by an unknown Northern hand, coming from the collection of the Hispanic Society in New York. The resemblance to Langlois was easily established because his portrait as a young man playing the bag pipes ( sourdelines , an aristocratic divertissement at that time) was painted in Rome circa 1623 by his best friend Claude Vignon as well as later in a wonderful likeness of him by Anthony van Dyck, again with his bagpipes in London during a visit there in the 1640’s. This portrait shows Langlois surrounded by his interests and the objects of his occupation, unrolling a canvas or a leather cover for his bookbinding trade and seated in front of more such scrolls, on the wall behind him an empty frame, a caliper and plaster medallions and on a table next to him his bagpipes, a leather-bound book, a stack of prints and the small marble head of a pretty young goddess. The remarkable strength of this portrait depends partly on the fact that it displays a certain amount of naïveté in modeling the figure, which gave rise to the possibility that it might be a self portrait, vide an engraving found at Harvard of a similar portrait of a man as Le Cornard Constant (see below), i.e. ‘The Constant Cuckhold’ signed in the plate Ciartres, Langlois’ nickname in Italian, the lingua franca spoken by his artist friends and as coming from the French city of Chartres. It indicates that Langlois knew how to draw and possibly paint. The name ‘Ciartres’ is also inscribed on the reverse of the canvas of this portrait. The painting also shows strong characteristics of Vignon’s later work in its fluidity and lack of color, but the specialist on Vignon, Dr. Paola Bassani Pacht has denied his authorship of this work. The portrait was acquired by theFondation Custodia in Paris, which was started by the Dutch art collector Frits Lugt and where it now hangs. La Naissance de la Vièrge, oil on canvas, size 71 by 56 cm. by Claudine Bouzonnet Stella (Lyons 1636-1697 Paris), the remarkable niece of the more famous Jacques Stella (www.Mujeres pintoras: Claudine Bouzonnet-Stella,1636-1697.com and www.L.exposition Jacques Stella à Lyon : enjeux et commentaires – La Tribune de l’Art.com). She mainly concentrated on making excellent engravings after her uncle’s paintings and those of Nicolas Poussin. This extraordinary image remained for a long time on loan as attributed to Jacques Stella at the Fogg Art Museum in Cambridge, Mass. Despite that a very similar drawing by her of the same subject matter has been in the Fogg museum since 1990 (Sylvain Laveissière, Jacques Stella (1596-1657), exhibition catalogue Musée des Beaux-Arts de Lyon and Musée des Augustins, Toulouse 2006, pp. 232/233, Fig. XV.1). Paintings by Claudine Bouzonnet Stella are rare and another one, the ‘Dream of Saint Martin’, signed and dated 1666 is in the Hermitage in Saint Petersburg. Expertise is by Dr. Sylvain Kerspern, affirmed by Sylvain Laveissière from the Louvre. In a private collection. A very fine and touching Ecce Homo by the Lorraine Mannerist painter Georges Lallemand or Lallemant (Nancy circa 1575-1636 Paris), oil on copper, size 33 x 28 cm., discovered under the auspices of Dr. Sylvain Kerspern. This very well preserved small painting has all the trademarks of the Lorraine Mannerist movement with the restless composition and the carefully depicted emotive expressions of the figures. One can compare the eccentric physiognomy of the taunting soldier to the right with the figure of the beggar in the lower right quadrant of the large ‘Charity of Saint Martin’ by Lallement kept in the Musée Carnavalet in Paris, while the face of the suffering Christ approaches that of the large figure of a king in the ‘Adoration’ by Lallemant in Saint Petersburg. The pathos of the depiction is enhanced by the youthful appearance of Christ in contrast to the Christ figure in the ‘Déploration’ by Lallemant in the church of Saint Nicolas-des-Champs in Paris, where the dead body of an aged Christ shows the effect of His fate. Lallemant is presently being studied in depth by the art historian Dr. Paola Bassani Pacht. This exceptional and remarkable work is now in a private collection. A re-established superb small work by Jacques Stella (Lyon 1596-1657 Paris), this oil and gold on copper, size 24.8 by 20.6 cm. of Dalila coupant les cheveux de Samson shows his invention of applying a scattered thin coat of leaf gold particles onto the paint surface, thereby highlighting parts of the composition in order to enhance all the colors. The Stella expert Dr. Kerspern has described the technique in the words of Andre Félibien (1619-1695), an early art historian as a rideau d’or, a ‘curtain of gold’. A similar small painting of Judith en prière dans la tente d’Holopherne of oil and gold on slate is in the Galleria Borghese, Rome (Sylvain Laveissière, Jacques Stella (1596-1657), exhibition catalogue Musée des Beaux-Arts de Lyon and Musée des Augustins, Toulouse 2006, pp. 96/97, illus. cat. 42 and cat. 43). Dr. Kerspern dates the painting to about the 1630’s in Rome and bases his reasoning on comparison with other dated works from the same period. One can find the curious shell-shaped helmet (casque en escargot) in an engraving by Charles Audran for a bookplate after Stella, dated 1630 in Rome. This very charming painting is presently in a private European collection. Retour d’Égypte by Jacques Stella, oil on copper, size 32.5 by 42.5 cm., which displays the same power in a small format as above. Here the painter contributes to the formation of the landscape in French art as Dr. Sylvain Kerspern has noted on his website (http://www.dhistoire-et-dart.com/Stella.html#StellaRetourGoyrand). The painting was engraved in the reverse by Claude Goyrand as illustrated and described in Sylvain Laveissière, Jacques Stella (1596-1657), exhibition catalogue Musée des Beaux-Arts de Lyon and Musée des Augustins, Toulouse 2006, page 117/8, cat. no. 55. Kerspern also dates this work as in Rome circa the late 1630’s. The superb rendering of the pastoral Arcadian landscape derived from the environment around Rome and of course the landscapes of Annibale Carracci and the delicate coloring makes this an unsually fine example of Stella’s craft. 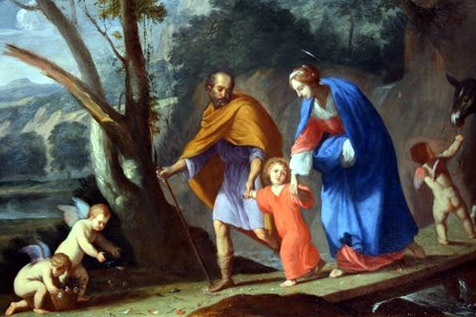 Nothing in the sweetness of the scene predicts the later life of the Christ Child, here depicted as a young adolescent after his years of refuge in Egypt. Also at present in a private collection. 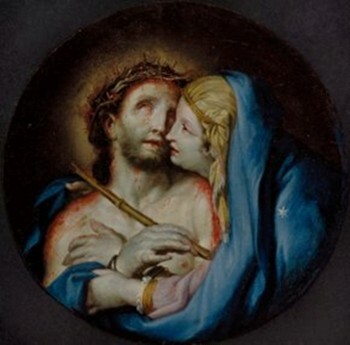 A fascinating small work by Claude François, (Amiens 1615 – 1685 Paris) called Frère Luc, a contemporary of Simon Vouet and Charles Le Brun depicting La Vièrge embrassant le Christ au Roseau, oil on copper, circular diameter size 19.6 cm. 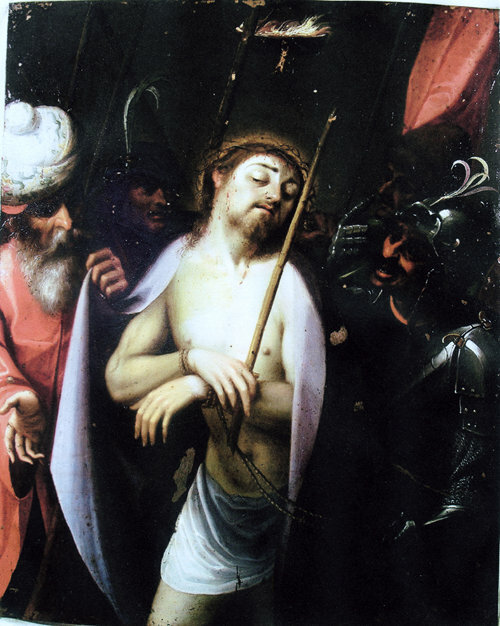 As described on La Tribune de l’Art, the subject matter is a curious combination in execution of the image of the Ecce Homo and that of the Pietaand obviously influenced by Guido Reni in the figure of Christ (http://www.latribunedelart.com/tableaux-récemment-acquis-par-le-musée- des-beaux-arts-de-montreal-article001376.html). Claude François, who in 1645 became a Frère Récollet (i.e. an adherent to the Augustinian Recollets, a mendicant and highly spiritual order), went in 1670 to Canada or as it was then known La Nouvelle-France on a mission to help reconstruct his religious order’s convent in Quebec. During his time in the New World (he returned to France in 1671) he painted altar pieces and smaller paintings, which have mostly remained in situ. This work forms like all of Frère Luc’s oeuvre part of the first Western artistic endeavors in Canada and he is considered to be a founder of the Canadian fine arts. (http://biographi.ca/009004-119.01-e.php?id_nbr=228) (http://fr.wikipedia.org/wiki/Claude_François_(peintre)). Claude François chose his convent name from the patron saint of all painters Saint Luke the Evangelist. The spirituality of this extraordinary artist is fully observable in our small painting. It has been in the Montreal Museum of Fine Art collection since 2008. Also a very interesting recent discovery was that of the Portrait of a Young Male Child, oil on paper laid down to canvas, size 46 by 35 cm., by the Franco/Flemish pupil of Jacques-Louis David, François-Joseph Navez(Charleroi 1787- 1869 Brussels). 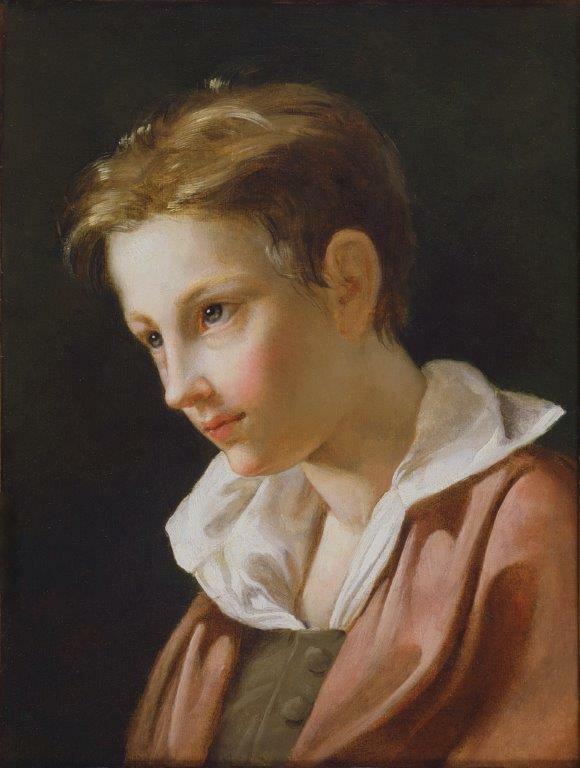 The sitter has been identified as Léon-Pierre Suys at about age six circa 1829/30, who is also depicted in a touching pensive portrait by Navez, presently in the Louvre and painted together with his sisters by Navez in a large portrait, now in a private collection, both dated slightly later (1831). Léon-Pierre Suys (1823-1887) was the son of a well-known Belgian architect and friend of Navez, Tilman-François Suys (whose portrait was drawn by Ingres). Léon-Pierre Suys later became an architect in his own right, designing amongst other buildings the beautiful neo-classical Brussels Stock Exchange (see Leon Suys – wikipedia).The portrait has been fully authenticated by Dr. Denis Coekelberghs, co-author of the exhibition catalogue for the important Navez retrospective in 1999/2000 which started at Charleroi, Belgium. Rather than the above described quick portrait sketch of a young woman by Navez, this is a more worked-out and careful image. The shy look of the boy di sotto in su is remarkable in catching the naive charm of the sitter. Typical for Navez is also the fine glazing of the skin making it look almost transparent, the wonderful painterly treatment with highlights of the unruly hair and the fairly sketchy way the large ear is painted (also quite visible in the portrait of a young woman mentioned above). Navez’s ability to catch the inner life of his sitters is well established in many of his remarkable portraits of the Belgian nineteenth century bourgeoisie and intelligentsia. In fact it matches in many ways the penetrating observation of their sitters with Dutch seventeenth century portraiture of children (and one thinks here of painters such as Michiel Sweerts). The painting is now in a private European collection. An important painting is La Vocation de Saint Jacques (The Calling of Saint James the Greater) by Claude-Guy Hallé (Paris 1652- 1736 Paris), oil on canvas, size 72 by 60 cm. This large oil sketch is thought to be a design for the banner which was carried around the Renaissance church of Saint Jacques de la Boucherie (Saint James the Greater of the Butchers Guild), which was destroyed during the French Revolution in 1797. Here originated the yearly pilgrimage to the legendary resting place of the saint in Santiago de Compostella in Spain. Only the beautiful landmark clock tower La Tour de Saint-Jacques remains of this church in the center of Paris near the Place du Châtelet. Our painting was recorded as being lost in the catalogue raisonné by Nicole Willk-Brocard, “Une Dynastie, les Hallé”, Arthena 1995, page 284, catalogue number C 42 under Peintures datées but as clearly described with its dimensions in the inventory of June 10, 1712 requested by Hallé to be made of his and his wife Marie-Suzanne Boutet’s possessions (Paris, Les Archives nationales, Minutier central, Willk-Brocard, page 645, Item 63). The old parish church of Saint James de Boucherie was built by Jean de Félin, Julien Ménart and Jean de Revier between 1508 and 1522, during the reign of king Francis I and it was the gathering place for pilgrims to Spain who came down the rue Saint-Martin in Paris and continued on their way South along the rue Saint-Jacques (the still existing street where many art dealers had their small galleries, like the widely known François Langlois in the mid-seventeenth century, who was painted by Anthony van Dyck and by Claude Vignon). The remaining tower is crowned by the statue of Saint James. Historically our painting is thus of great importance to the City of Paris, because it represents a record of significant events during several hundred years of human faith. 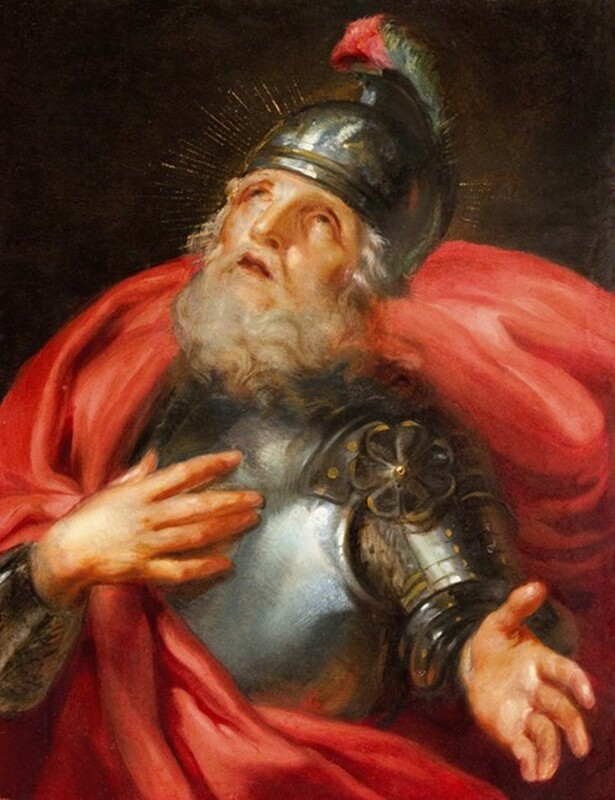 The cult of Saint James is still very strong and it was spread from Spain to its overseas possessions, where the saint is revered as the apostle of peace. Nicole Willk-Brocard has agreed fully to the attribution. It will be published as one of ten newly discovered paintings by Claude-Guy Halle in the Revue des Musées de France by Dr. François Marandet. The painting is now in a private collection. A valuable and unusual addition to his small works on copper by the French/Canadian painter Claude François or as he was later called Frère Luc (1614-1685) is this image of Saint William of Aquitaine , a soldier renouncing military life in order to become a monk. The size is 22.5 x 17.5 cm. The saint is shown in a flaming red mantle as if engulfed in a purifying fire. His armor is adorned very clearly with the stylized golden rose symbolic of the Provence (later brought to England with his daughter Eleanor of Aquitaine). As Dr. Sylvain Kerspern, the specialist on Frère Luc has remarked, the artist traveled much and many documents have been lost during the French Revolution, but a fine painting by him remains in a church in La Rochelle, the seaport on the Bay of Biscayne established by William of Aquitaine, with could explain this representation of one of the patron saints of Aquitaine. 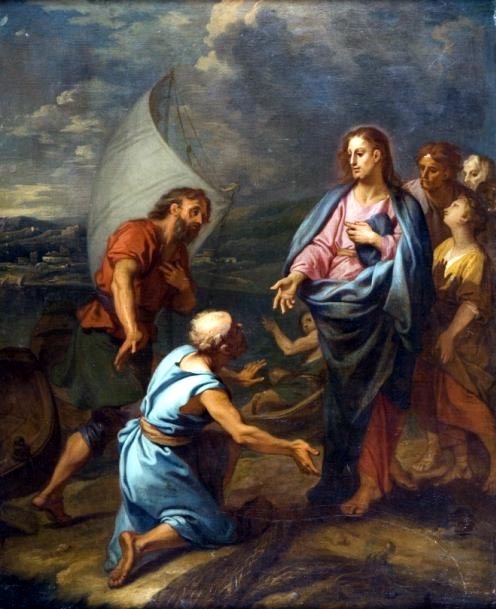 But since this is a small oil on copper it probably was not meant for a church but for private devotion and commissioned by someone named Guillaume or just to honor this saint in which case the La Rochelle connection appears interesting. The highly emotional aspect however of this painting would suggest from the quite rare iconography a greater interest in the devotional value than in the actual historical facts of the represented saint. In Canada as stated above with the description of the La Vièrge embrassant le Christ au Roseau, now in the Montreal Museum, Frère Luc is considered to be the first authentically Canadian artist (FRANÇOIS, CLAUDE, Frère Luc – Dictionary of Canadian Biography Online ). Also see Jérome Montcouquiol, Quelques petits formats de Frère Luc (1614-1685) on La Tribune de l’Art, July 29, 2012, described and illustrated as number 17 (http://www.latribunedelart.com). The painting is now in a private European collection. 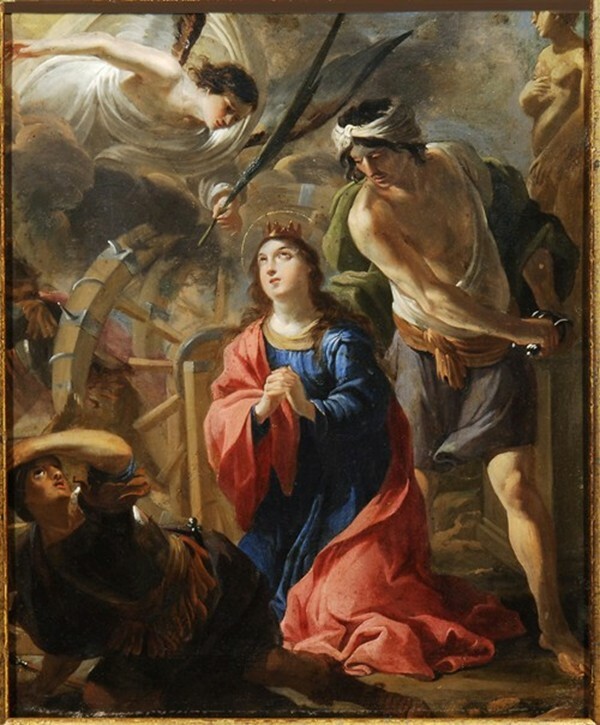 The Martyrdom of Saint Catherine of Alexandria is by the remarkable high baroque French painter Jacques de Lestin or Létin (Troyes 1614-1673 Troyes), as advised by Dr. Sylvain Kerspern, supported by Dr. Patrice Marandel of the Los Angeles County Museum and verbally approved of at a Paris exhibition by Sylvain Laveissière, chief curator of paintings at the Louvre. This very touching and superb oil on copper datable to possibly the 1620’s in Rome, size 24.8 by 20.3 cm, probably served as a small personal devotional painting for a royal or aristocratic client. It takes its composition partly from Carravaggio’s Martyrdom of Saint Matthew in the Roman church of San Luigi dei Francesi (Saint Louis of the French), which almost naturally also inspired Claude Vignon for his renowned painting of the same subject matter now in Arras, dated 1617. De Lestin is recorded as having arrived in Rome in 1622, living with his painter colleague Charles Mellin (who equally used the image of the descending angel from Carravaggio) and the sculptor Jacques Sarrazin. De Lestin is described as coming for the first time during Easter 1624 to Simon Vouet’s studio, who himself had already arrived in Rome in 1614. De Lestin studied the large works of the then ténèbriste Vouet and obviously was much influenced by his style. Back to France in 1626 de Lestin was asked to execute many works outside his birthplace of Troyes and he kept in contact with Vouet and his circle who returned in 1627 to Paris. This exquisite small work displays the particular physiognomy and typical musculature seen in de Lestin’s larger works. 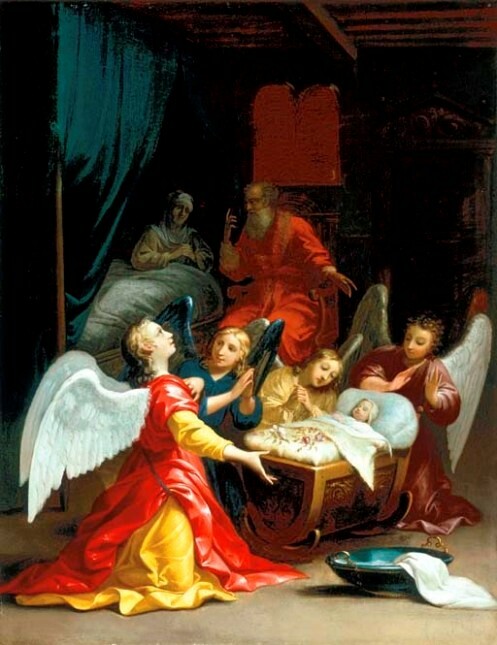 The nervous movement of the brush, heavy swirling drapery, the clasped hands and the flickering light coming from above left, casting deep soft shadows and the vibrant coloring denote the theatrical baroque efforts of the French artistic Counter Reformation, intending to show the spiritual strength of the Saints. The artist succeeds in depicting the cruelty of the moment with a moving but superb and very poetic pathos, much like what Vignon expressed in his Saint Matthew, while also having been influenced by the early Roman works of Vouet. Notwithstanding the size of this small amazing work, it shows the full power and talent of this quite unusual artist, cf. Jacques de Létin, exhibition catalogue Musee des Beaux-Arts de Troyes, 1976, with a preface by Jacques Thuillier. The painting is now in the collection of the Museé des Beaux-Arts de Troyes, France (http://www.latribunedelart.com/un-nouveau- jacques-de-letin-pour-le-musee-des-beaux-arts-de-troyes). Le Départ d’Achille pour aller retirer le corps de Patrocle des mains des Troyens (Achilles setting out to retrieve the body of Patroclus from the hands of the Trojans) circa 1781, a fine oil sketch on canvas, size 54 x 68 cm., by Nicolas-Guy Brenet (Paris 1728-1792 Paris). Brenet was formed in the studio of François Boucher, an influence traces of which are still visible in this oil sketch but he painted in a more muscular fashion and with paler colors than his former master. The subject matter of the final painting Le combat entre des Grecs et des Troyens sur le corps de Patrocle for which our oil sketch is a première pensée (a first thought) was chosen for the king in 1781 even though it was unusal for Brenet, who was by that time a professor at the Académie royale. But a taste for depictions of the Homeric saga of the Iliad was à la page(fashionable) for the French since about 1760 and the tale of Achilles and Patroclus had by that time already been chosen for the entry in the 1769 Prix de Rome competition ( Achille, après avoir trainé le cadavre d’Hector, le dépose aux pieds du lit où repose le corps mort de Patrocle – see above under Suvée). 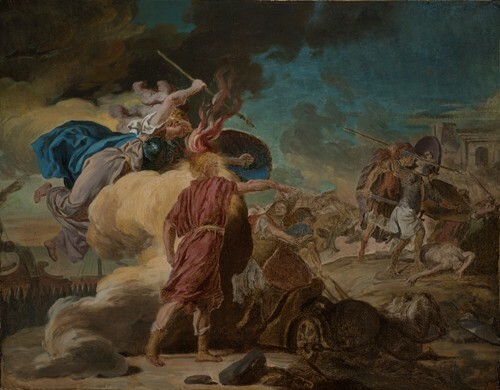 This oil sketch as a preliminary thought was followed by a final version before the large painting itself was executed which in this case brought the Greeks and Trojans in their fight for the dead body of Patroclus into the foreground and reduced the figures of Achilles and Minerva to a secondary plane, turning as it were the focus of action around. The large painting itself was hung in the Louvre and generally critiqued for its cruelty, which is interesting because the trend for violence in French art was transferred into the 19th century. This oil sketch is listed together with another one in Brenet’s legacy in Marc Sandoz ‘s Catalogue raisonné on Brenet of 1979, number 96, pages 113 and 114 under Travaux préparatoires: b). Achille couvert de l’égide de Minerve, s’avance au-devant des Grecs qui combattent pour le corps de Patrocle (Preparatory works: b). 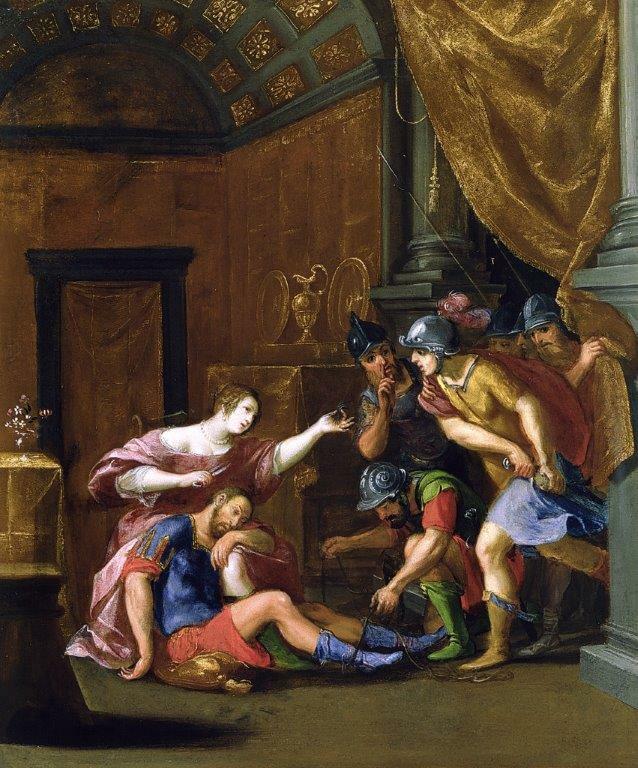 Achilles covered under the protection of Minerva moves forward in front of the Greeks who do battle for the corpse of Patroclus). Sandoz explains that the final sketch listed by him under a). with the similar description but more worked out is more like the painting belonging to the French king and that work has been discovered at auction this year in France and will be brought by the Galerie Didier-Aaron to the Paris Tableau 2015 Fair in November, while ours b. ), the smaller one seems to be more of an ébauche, i.e. a preliminary draft (semblerait être la première pensée) and as such the first endeavor by the artist. The size of these sketches is given in the sale of the deceased painter’s goods in 1792 as 20 x 26 pouces, which in present day measurements translates to circa 53 x 69 cm, close enough to the size of our sketch. Curiously enough what disturbed Brenet’s contemporaries was the depiction of Achilles as a golden-haired and bearded young man without the attributes of a Homeric hero with plumed helmet and a gleaming breast shield, which in this case gives more poignancy to the tale of the friendship between these two protagonists, while Achilles’ sorrowful anger about the death of Patroclus is symbolized by the crest of flames emerging above his head. Recent research may prove this to have been a preliminary idea for a ceiling decoration at the Louvre because of the added uppermost corners; at the time in 1781 that such a commission was in fact extended to the painter Antoine-François Callet. The oil sketch is now in a private European collection. 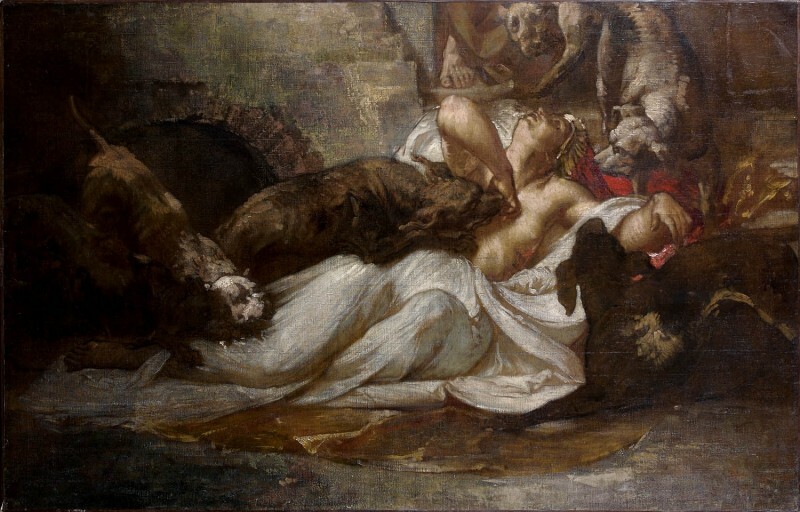 Le Songe d’Athalie (The frightening dream of Athalie about the fate of her mother Queen Jezebel, defenestrated from her palace and devoured by wild dogs), a large cartoon oil sketch / partial design, size 69.5 x 109.8 cm from 1879 by Alexis-Joseph Mazerolle(Paris 1826-1889 Paris) for his huge Theatre-Français ceiling painting at the Comédie-Française in Paris. Founded by Louis XIV in 1680, the theatre is now housed near the Palais Royal. This cartoon was bought as probably by François-Nicolas Chifflart (1825-1901) and erroneously considered to have been restored and cut down from a larger size. Mazerolle’s designs for the ceiling were very much admired and images of the ceiling are published on the website prepared by his admirers (http://www.ajmazerolle.com/mazerolle-plafonds-peints-decors-theatre.html). There is a renewed interest in this artist, considered to be one of the best decorateurs of the late XIX century in France. An exhibition of most of his works is presently being held in the museum La Piscine de Roubaix with a fine exhibition catalogue (Mazerolle 1826-1889. Itinéraire d’un grand décorateur) and an illustrated article discussing this exhibition on La Tribune de l’Art(Mazerolle 1826-1889. Itinéraire d’un grand décorateur – La Tribune de l’Art). The painting is now in a private collection in France. Interestingly the nineteenth century showed a remarkable obsession with nightmares from Fuessli to Poe, from Mary Shelley to Mallarmé. The leitmotif for the ceiling was La France couronnant Molière, Racine et Corneille and Racine wrote the unforgettable “Dream of Athalie” (Jean Racine, Athalie, acte II, scene 5):“C’était pendant l’horreur d’une profonde nuit. Ma mère Jezebel devant moi s’est montrée, Comme au jour de sa mort pompeusement parée. Ses malheurs n’avaient point abattu sa fierté; Même elle avait encore cet éclat emprunté Dont elle eut soin de peindre et d’orner son visage, Pour réparer des ans l’irréparable outrage. “Tremble, m’a-t-elle dit, fille digne de moi. Le cruel Dieu des Juifs l’emporte aussi sur toi. Je te plains de tomber dans ses mains redoutables, Ma fille” En achevant ces mots épouvantables, Son ombre vers mon lit a paru se baisser; Et moi, je lui tendais les mains pour l’embrasser Mais je n’ai plus trouvé qu’un horrible mélange D’os et de chairs meurtris et traînés dans la fange, Des lambeaux pleins de sang et des membres affreux Que des chiens dévorants se disputaient entre eux”. A glowing Allegory of Requited and Abundant Love, by Charles Poerson (Vic-sur-Seille 1609 – 1667 Paris), circa the mid-1630’s (? ), oil on canvas, size 93 x 75 cm. The composition takes its inspiration clearly from the 16th century engraving by Giovan Battista de’ Cavalieri (1525-1601) after a seated antique marble Venus flanked by Anteros and Eros, kept in the Chiaramonti collection in the Vatican museums. The figure of Cupid as Anteros is directly taken from a fresco by Raphael circa 1516 in the Vatican (Stufetta del Cardinale Bibbiena) which was engraved by Agostino Veneziano (ca. 1490-ca. 1540) now kept in the Metropolitan Museum, New York. 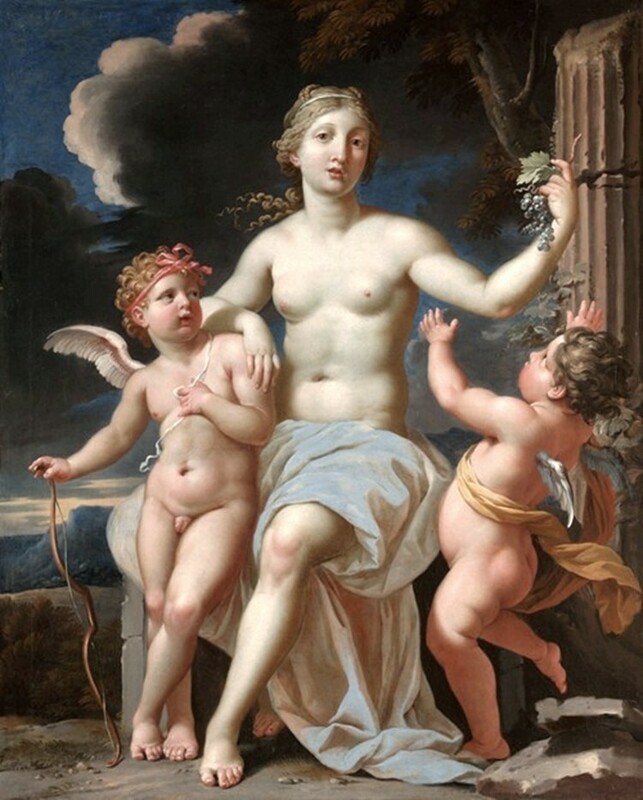 This Allegory of Love and Abundance would appear to be an appropriate summation of Poerson’s Atticiste style inspired by the Bolognese school of painters, incorporating an inventive disegno and subtle coloration with an admirable gift for conveying refined sentiment. The face of Venus is directly reflected in the face of Helena in Poerson’s small tondo of L’Enlèvement d’Hélène in the Louvre (Barbara Brejon de Lavergnée, Nicole de Reyniès and Nicolas Sainte Fare Garnot, Charles Poerson (1609-1667), Arthena 1997, color plate 2, cat. no. 3, page 78). It is only in the last thirty years that historians have come to recognize Charles Poerson as a major exponent of the new classical style in France during the reigns of Louis XIII and Louis XIV. Art historians like Clementine Gustin-Gomez have attempted to restore him to prominence by distinguishing his work from that of his contemporaries. Dr. Gustin-Gomez wrote about the Allegory of Love and Abundance that the attribution is a very good idea without having seen the painting in person. Dr. Dominique Jacquot at the Strasbourg Museum of Fine Arts concurs. The attribution is fully accepted by Patrice Marandel, European painting curator at the Los Angeles County Museum. This painting was suggested already as a work from Charles Poerson’s hand by Jean-Claude Boyer, formerly from the Académie de France in Rome and by Sylvain Laveissière, the Louvre’s emeritus chief curator of paintings, based on the resemblance of the figures in this work to paintings and drawings known to be by the artist. Among Poerson’s more famous works are the large and fine allegorical portrait of the young Louis XIV as Jupiter and victor over the Fronde rebellion hanging in Versailles and his beautiful and classical Camma et Synorix in the musée des Beaux-Arts in Metz, both of which relate directly to this superb Allegory, in particular in the faces and bodies of the grand figure of Louis XIV and the suffering Camma. Our painting comes from a notable private collection in Rome and was exhibited at the New Orleans Museum of Art as by a close pupil of Vouet in 2008-2010. The painting was also on loan to the Los Angeles County Museum of Art as attributed to Poerson in 2012/2013 (http://www.lacma.org ). The painting is in a private collection in France. Copyright © 2019 French Old Masters. Powered by WordPress. Theme: Spacious by ThemeGrill.